Hi Jake, it was my pleasure to see you folks and give you the test. Glad you had a good time, that’s what it’s all about, welcome to the Orcas! John– thanks for coming out and testing our group. I’m pretty wimpy about the cold, but I didn’t find the water to be that bad. Of course it helped that the air temp was pretty warm. I congratulate our newest members. Dr. Berg, Dave and I went swimming at Shadowcliffs 2 weeks ago and can appreciate the cold water and the effort. As a technical matter, I thought that the Orca rules mandated that a swim test could not be taken in a wetsuit. I am not proposing that people take the test in 52 degree water, but is there a waiver for taking the test under extreme conditions? 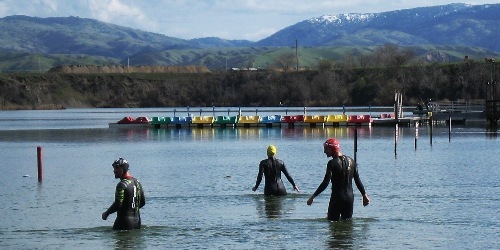 If the water is below 63 degrees F (which is fairly cold), we will allow the tester to wear a wetsuit. Few people would choose to swim in really cold water, just to get around the “no wetsuit” rule. If during the test, we feel that the tester would not pass without a wetsuit, we will not pass them. It is a qualitative assessment, but then so is Olympic diving, figure skating and gymnastics.